Detroit. Charlotte. Birmingham. San Antonio. 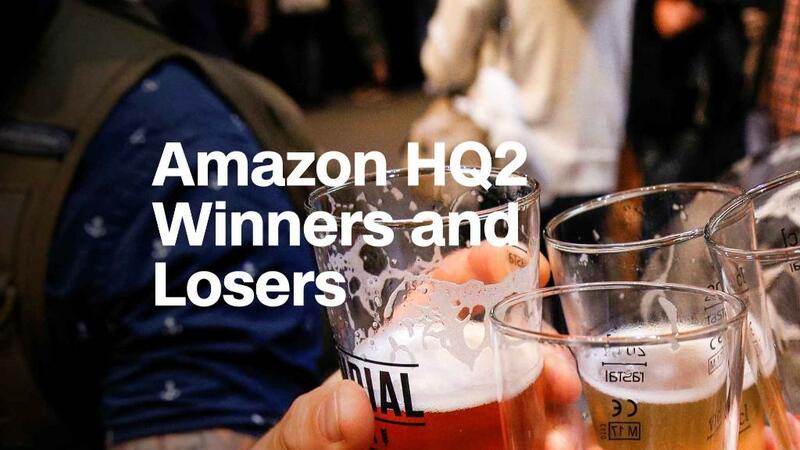 Those are just a few of the big names that didn't make the final list of 20 cities Amazon (AMZN) is considering for its second headquarters. With 238 proposals submitted, there were bound to be lots of also-rans. But a few notable cities and proposals got snubbed. Kansas City, Missouri, whose mayor wrote reviews on 1,000 Amazon products as part of its bid, didn't make the cut. Neither did a campus that would have spanned the U.S.-Mexico border. And a number of metropolitan areas considered to be viable contenders, such as Minneapolis and Charlotte, were also nixed. Here are some of the slights. The Motor City, which declared bankruptcy in 2013, pitched itself to Amazon as a region experiencing an exciting revival. "Move here. Move the world," declared a flashy video that accompanied its bid. Detroit's 242-page proposal, reviewed by Crain's Detroit Business, shows that the city offered to remake its downtown area -- as well as 30 years of hefty tax breaks. The state also said it planned to launch a $120 million initiative to expand its tech workforce. But it wasn't enough for Amazon. "We would have loved to have made it into the next round for Amazon's second headquarters but everyone here is incredibly proud of the proposal we submitted," Mayor Mike Duggan said in a statement. Kansas City Mayor Sly James gave five-star reviews to 1,000 random items on Amazon to woo HQ2. Kansas City's advantages were worked into every one. "I'll tell you, when I'm sitting out in the backyard of my reasonably priced home in a safe neighborhood with great schools and these chimes start to tinkle, it feels like the whole world is singing just for me," the mayor wrote in a review for $14.99 wind chimes. Alas, Kansas City's gambit didn't work. "We competed well," James told CNNMoney on Thursday. But he admits to being a little bit relieved to be out of the running. "Something like Amazon doesn't come free," James said. "There's a cost. I think everyone was looking at the benefit and not the cost." There's a good reason San Antonio didn't make the shortlist. In October, it took itself out of the running altogether. In a letter to Amazon CEO Jeff Bezos, Mayor Ron Nirenberg said that while San Antonio has a "competitive toolkit of incentives" to offer, "blindly giving away the farm isn't our style." So the city passed on submitting a formal bid for HQ2. "It's hard to imagine that a forward-thinking company like Amazon hasn't already selected its preferred location. And, if that's the case, then this public process is, intentionally or not, creating a bidding war amongst states and cities," Nirenberg said. Still, all is not lost for Texas. Both Austin and Dallas are finalists. Alabama's biggest city installed three massive Amazon delivery boxes around town to publicize its formal bid, called "Bring A to B." But it was all to no avail. Birmingham didn't make it through. If Birmingham was disappointed, at least it showed a good sense of humor on Twitter. Utah is disappointed that it's not a final contender -- but the state was pretty frank about its own shortcomings. "From Amazon's initial call for proposals, we knew Utah would be at a disadvantage due to our proximity to their current headquarters and our small population size," Val Hale, executive director of the governor's office, said in a statement. "Consider Charlotte, USA as your new Prime destination." That's how Charlotte pitched itself in a video proposal for Amazon's second headquarters, in which the city played up its appeal to millennials. But Charlotte, home of Bank of America, (BAC) won't be home to HQ2. In a tweet Thursday, Charlotte Mayor Vi Lyles said she was "proud" of the city's effort and asked everyone to support nearby Raleigh, North Carolina -- which is still under consideration. Minnesota took a low-key approach to the application process, since Amazon competitors Target (TGT) and Best Buy (BBY) both have their headquarters in the state. Given its relationships with those companies, Minnesota would be "restrained" in what it offered Amazon, Governor Mark Dayton said. But subtlety did not work, and neither, Minneapolis nor its twin city, St. Paul, made Amazon's final list. Amazon already has plans to expand its presence in Vancouver, so it's in better shape than many of its competitors. In November, Amazon announced that it would double its workforce in the city from 1,000 to 2,000 employees by 2020. "We continue to stand 100% behind the metro Vancouver proposal -- the result of an unprecedented effort in regional economic development -- which fully demonstrates what Vancouver has to offer any business that chooses to make this region its home. This includes Amazon, which continues to make increased investments into Vancouver," the Vancouver Economic Commission said in a statement. Toronto is the only city in Canada that made it into the top 20. Portland -- sometimes seen as Seattle's younger sibling -- was also left out. "We're your neighbor. Your home away from home. Your partner in this next adventure," Portland said in its pitch. Ultimately, though, Amazon was probably looking to move beyond the Pacific Northwest. Los Angeles is the only West Coast city still in the running. To promote Southern Arizona, the economic development group Sun Corridor put a 21-foot Saguaro cactus on a truck and sent it to Amazon. "We wanted to make sure Mr. Bezos and his team notice us and send a message of 'we have room for you to grow here for the long term,'" Sun Corridor CEO Joe Snell said in a statement at the time. Unfortunately, the cactus -- however sizable -- didn't put Tucson on top. It appears Amazon wasn't open to a campus spanning the U.S.-Mexico border. The creative approach, pitched by two New Mexico-based nonprofits, would have had a footprint in El Paso, Texas; Juarez, Mexico; and Las Cruces, New Mexico. "Although we are disappointed that our cross-border, binational campus proposal was not part of the shortlist, we understood from the beginning that we were offering a new and unique value proposition and solution that would be foreign to any company, including Amazon," Davin Lopez, CEO of the Mesilla Valley Economic Development Alliance, said in a statement. But the group isn't giving up hope yet. "We feel an innovating private sector, whether that be Amazon or someone else, has the opportunity to take the lead in making this happen," Lopez said.